What does "The Midnight Ride of Paul Revere" by Henry Wadsworth Longfellow have to do with setting a festive table? In addition to being the man who sounded the alarm "to every Middlesex village and farm," Mr. Revere was a skilled silversmith. 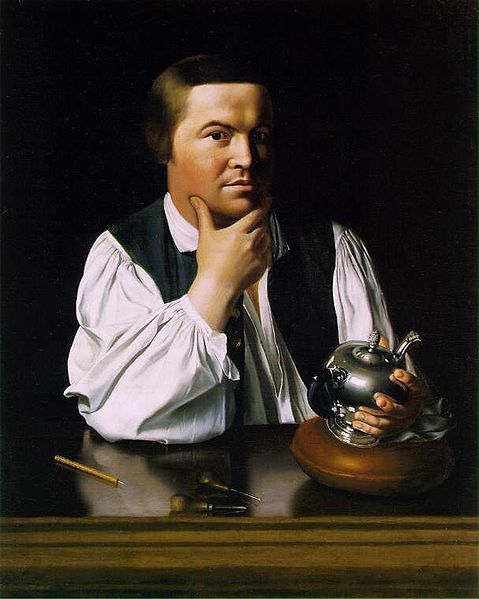 Paul Revere is seen below in a 1768 portrait by John Singleton Copley. He created the Liberty Bowl which, along with the Declaration of Independence and the Constitution, have been called the United States of America's three most cherished historical treasures. 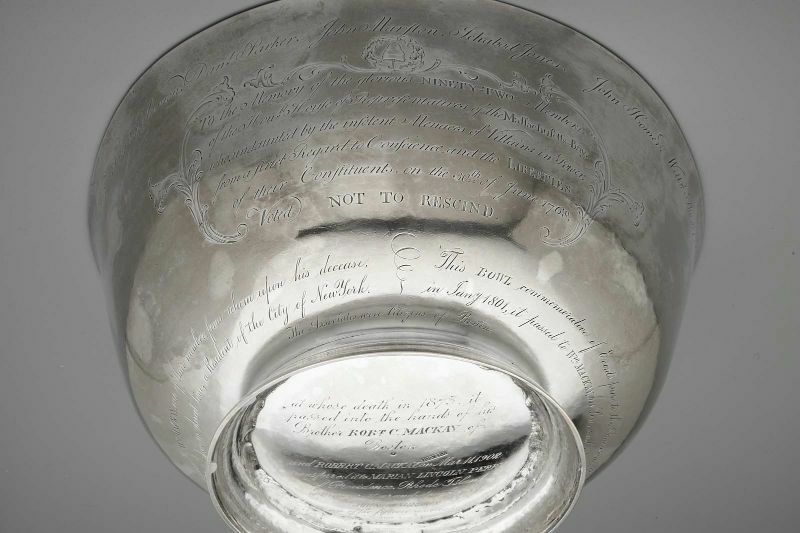 This silver bowl documents a revolutionary act in the American colonies. 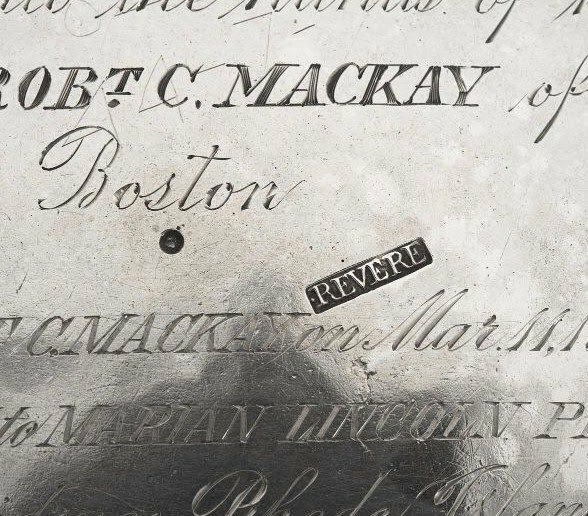 Engraved on its rim are the names of fifteen members of a secret organization in colonial Boston called the "Sons of Liberty." This group existed during the time when ferment against British rule was building towards war. The bowl commemorates the refusal of the Massachusetts legislature to take back a protest against a British tax. The bowl was purchased for $52,500 by the Museum of Fine Arts, Boston, Massachusetts, in 1949, with funds that included seven hundred donations by Boston schoolchildren and the public. 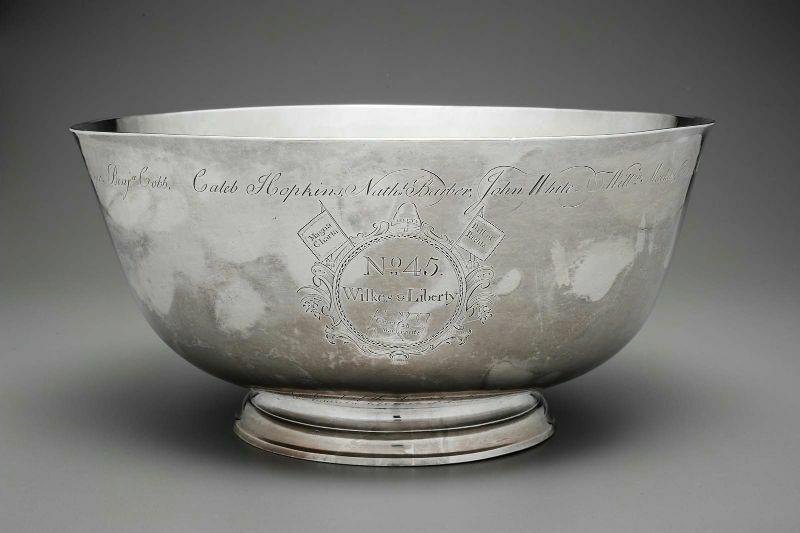 The bowl was used at covert meetings of the Sons of Liberty, whose members included Revere and other Whigs, for toasting with rum punch. Since it was engraved with patriotic slogans along with the names of its joint owners, it was considered a treasonous object and therefore was kept well hidden between meetings. There's only one Liberty Bowl, of course, but its classic shape and proportions have been reproduced countless times by a variety of manufacturers. The pieces are usually referred to as "Revere bowls," whether made of sterling, silverplate, brass, pewter, or porcelain. I've been collecting Revere bowls (mostly silverplated ones) for a few years now. I used five of them as containers for the flowers on today's table. They're also wonderful for serving/displaying fruit, potpourri, decorative objects, etc. I wanted the flowers to be the focus of attention, reflecting the coming of spring. I've kept the tablecloth, china, flatware, and stemware fairly neutral and simple in design. The three center bowls are slightly larger than the ones on the ends. I had vintage glass flower frogs that fit the three larger bowls. I used those to hold the flowers in place. For each of the two smaller bowls, I submerged a heavy oasis-filled ironstone mug. The wet floral foam held most of the stems in place, and I added filler flowers around the edges. At each place setting, as a reminder that Easter's on its way, I placed a vintage glass salt cellar filled with pastel-toned eggs (jelly beans from Dollar Tree). I decided it looked better not to include the blue ones, so I carefully removed those ... and ate them. Cream pitchers can do double duty. They work well for serving dressing for the salads. To further the "focus on flowers" theme, pale pink napkin "roses" are nestled in green restaurant napkins and displayed in the water glasses. I hoped the informal floral arrangements would create a feeling of abundance and exuberance. Most of the flowers, shrubs, and flowering tree cuttings came from the garden. Those include tulips, hellebores, red-tipped photinia, dogwood, and redbud. A (reduced) bouquet from Kroger provided the mums and alstromeria. Here are a few other Revere bowls I've collected. You can purchase new ones in the $50 to $150 range, but I prefer buying them at estate sales and thrift stores for as little as $1. I paid $5 for the one with the colorful liner. It's great for serving acidic things like fruit salads and garden salads containing eggs, tomatoes, etc. (which would quickly tarnish and possibly damage the silver plating). I placed an assortment of small silverplated bon bon dishes on the bar. Compare the ornate designs of the Art Nouveau pieces with the sleek, curvilinear shapes of the mid-20th century modern bowls. Through every change in popular design trends, the classic lines of the Revere bowl have remained elegant in their simplicity. It's easy to see why its popularity has endured for over two hundred years. The Jamestown flatware pattern was introduced in 1916 by Holmes & Edwards, a division of the International Silver Company. Their advertising slogans "More than Plate", and "Protected where the wear comes" referred to their plating process in which an extra thickness of silver was added to the areas that wear the most on silverware. Many of these pieces are still in excellent condition today, almost 100 years later. If you think you'd like to try your hand at creating a rosebud napkin fold, there's a step-by-step video demonstrating how it's done at www.southernladymagazine.com. Click on "web extras" and select "step-by-step video of ET napkin fold." The tall, hand-dipped candles were new-in-the-package at Goodwill. Looking through the sunroom and across the deck, you can see the redbud tree that contributed to the floral arrangements. I placed a Paul Revere water pitcher on each end of the table (one filled with tea). You can order a new one here: http://www.silvergallery.com/sgRB-S501.html. The new ones are beautiful, but I think I prefer the look (and certainly the price) of the ones that display the time-worn patina of years of service to their owners. I put the leftover supermarket flowers in a vase (actually a heavy drinking glass) and added them to the vignette on the bar. Time to light the candles ... 7 of the glass tealight holders came from an estate sale. I found the 8th one just the other day at Goodwill. I used vintage Fostoria single-light candleholders -- two each of two different patterns. The stemware is Fostoria's Puritan (1957-71). The china is Trudy by Noritake (1971-86). It was my first set of formal china and remains one of my favorites. Even though spring has almost sprung, evenings are still cool in West Tennessee. The fireplace provides ambience and adds a cozy warmth. I hope you've enjoyed your visit today. 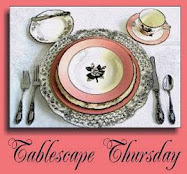 Please join Susan of Between Naps on the Porch for Tablescape Thursdays: www.betweennapsontheporch.blogspot.com. I will say it until the cows come home. Mr friend. You know how to set a table!!! The jellybeans are the perfect touch to the table. Everything looks so well thought out and yet still very comfortable and cozy. Lovely table Bill even if the cows have come home already!! Oh my goodness, the whole table is beautiful, but the centerpiece is stunning, Bill! What a gorgeous table! I love the flowers and that they mostly came from your own gardens. The tealight holders are beautiful the way they glow like little fires. Thanks for the history of Revere ware - a beautiful classic! Silver simply makes me swoon! We used Revere bowls to hold the floral centerpieces at our daughter's wedding reception. Love your playful use of salt cellars as little jelly bean holders! And the roses napkin holders are beautiful! I love your work and your educating your followers! You have marvelous taste and quite the collections, and I love it all! Evening Bill.Lovely tablescape. I am not sure at this time of year that you or I could sit at the table with all those beautiful flowers, I would spend the whole time sneezing (Hayfever). I thought how nice Middlesex in the UK has got a mention. then I found out from Google it is a school in Massachusetts!! I was waiting to see something in your post about the beautiful carving set. 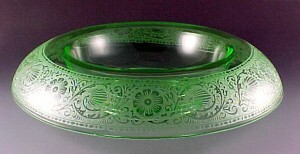 Love the revere bowls, haven't seen or heard of them before. We don't seem to sell jelly eggs here in the UK except in the American Candy store nearby. I bought some there recently and some malted eggs but me being naughty have already eaten them, I will have to go and get some more as I love them!! Regards, Jackie in Surrey, UK. Great post, gorgeous table, decoration... I love it! Darling man, you are amazing! Bill, those floral arrangements may be "informal," but they are glorious. I would use them on a formal table any day of the week. Bravo! Loved it all. I particularly loved your night shots with the candles lit. So lovely. Interesting info about the Liberty Bowl, too. I have some Revere bowls in various sizes, and while I have always used mine for flowers, I adore the way you used so many on your table, Bill. What a statement! I wish I lived closer because I would invite myself to dinner! wonderful table and very interesting post for me as a silver lover. What an amazing story about the bowl. I love its organic shape which the wine glasses follow widely. Each item on your table is great and perfect selected. How did you make the photo of the silver pitcher without mirroring your camera? Are you a wizard? A very pretty table. Love your revere bowls!!! Love the jelly beans and sorry that you had to sacrifice by eating the blue ones! Everything is stunning Bill. I love the Revere bowls and your little salt cellars with eggs - how clever. I did not know the Revere bowl history but now that I think of it, wondered why they were called Revere! Love that Jamestown silver. My favorite you have I think. Bill, the colors you have put together are lovely. Beautiful photos as usual. Bill, your table is stunning! I adore your collection of Revere Bowls, crystal and china patterns. You always surprise us with a very unique story about your tables and this one was most interesting. I love the stories, so don't ever stop. I always take some sort of notes so that when I'm out at our local Goodwill store, an antique mall or thrift store I have reference material. You've helped me so much. Thank you for always sharing such lovely tables and interesting stories with us. Bill, you out did yourself with the flower arrangements! They are so lush and colorful and what a great use of the revere bowls! Everyone from end to end can enjoy these beautiful flowers! I love how you carried the theme with the flower shaped napkins. You thought this through so well even down to the salt cellars with jelly beans! I can see why your first china set is a favorite. The pattern is classy and I love the shimmer you captured with the candlelight on the 3rd to the last photo.. You amaze me with all your flatware, I'd have a hard time picking which one to use each time! I will pay more attention to the revere style bowls in the future. Thanks for the story, it's always enjoyable to read your postings! What a great way to welcome spring! Think Spring will ever settle in? Another very cool, damp, cloudy day again. I taught that poem every year for MANY years! Snow is predicted for this weekend here, not a bloom in sight! Enjoy yours! Thank you Bill for the lesson on The Revere Bowl! I am almost certain that every American household must own at least one. But to own five is certainly an accomplishment. Love how you used them for your centerpieces. The table is stunning and I enjoyed your post today. Amazing, just amazing. I have a couple silver pitchers from my grandmother that look similar. I will have to check their marks to see what they are. I LOVE the salt cellars with jelly beans! Such beauty in your details. Please, please, PLEASE put me on your guest list! I have missed your beautiful tablescapes. So glad you are back. You are so blessed to own so many wonderful pretties. Thanks for giving us the history on your wonderful collections. What a glorious table you've created. Very well appointed and a feast for the eyes before one even thinks about the meal that would accompany such loveliness. Holy Macaroni. This is my favorite table of yours yet, Bill, and that is really saying something since I've loved so many. I don't even know where to begin. I loved it all. I will definitely have to learn how to do the napkins. I want to use it for my next luncheon club. I love Revere bowls and the way you've used them. The flowers are beautiful, and only YOU could manage to make jelly beans look elegant. You ate the blue ones! That has me laughing at the pains we take to get it right. LOL. Your flowers are absolutely stunning. I am so happy that you have this profusion at your fingertips. this way I can live vicariously through you! I love your china, silver, crystal, revere bowls. I loved the history lesson and seeing the original. I always learn more here. And when I use my bowls from now on, I'll be thinking of this post! Another winner. Your table looks like it should be in a book! Bill - I don't know how you always outdo yourself... Your tablescape is true bliss! And I am so glad that I never threw out my revere bowls. lol!!! Yes - I almost sold them at a garage sale about 20 years ago. Some lucky would've purchased them for $5.00 and used them in a beautiful tabelscape! Good thing that they are packed away nice and safe. I think it's time to take them out and enjoy. I only have one little Revere bowl but it sure comes in handy. I would love to find more. The glass tealight holders are really nice. I must keep an eye out for those. I love your table! It is so beautiful with all the silver....I do love silver! I have one Revere bowl smack in the middle of my table today. I never thought of lining several down the middle as you have done. It's very dramatic and beautiful. As always, a visit to your blog is a treat! So lovely. Candlelight makes it even more elegant. I especially like the small salt cellers with jelly beans. No flowers here yet between cold days and rain. Miss the springs of the south. Have a good day! Beautiful as always and I love that china pattern. Great your Revere collection, all the blowls are beautiful Bill. I love your three flower arrangements, very pretty! I like that whole elegance of your lovely table, as always. Love the napkin folds! Was your mouth blue after you ate all the blue jelly beans? I love this post, like always, everything so wonderful. can you believe that at one time i didn't really care for silver? now i love it. 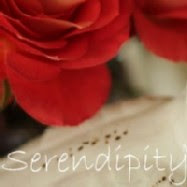 in part, due to the stunning use of it on artistic and beautiful blogs such as yours. i'm getting up the nerve to try my first tablescape and 'affordable accoutrements' is my textbook. How's my bro doing???!!! I was offline for weeks with laptop problems, so I am trying to catch up on all the blogs I missed. As usual, your floral arrangements are beyond compare; and, as usual, I am crazy for all of your silver bowls, dishes and pitchers! You always do a beautiful job with your tablescapes. Hope you have been well, Bill! Bill!!!!! Hi!!!! I'm sitting up in bed now for short periods of time and AWAKE! Where in the world did the last 4 days go??!?!! My husband has lent me his very slow but welcome laptop so that I can reconnect with the outside world again. I was tickled beyond pink when I saw that he reached out to you!!! He is so funny! He can't usually remember ANYONE'S name, so that was the first kicker! Even crazier is that he remembered enough about how to operate Word Press as to be able to post for me! I had not been worried about it (because I was knocked out!) until last night when the pain meds started to wear off and I became a bit more lucid. He really looks out for me. Thank you for writing back to him. He works constantly and doesn't get to "play" very much, so this was fun for him. That you actually responded to him made his day! :-) Enough about that...your table: FABULOUS!!! When I saw the Liberty bowl, I thought, "Oh, my gosh...where did he get that?!!?!?! If he says he got that at a thrift shop, I'm going to cut my wrists right here and now!!!" Then I read the text and my heart calmed down. I have an extensive collection of Revere bowls in various sizes that I absolutely love. I (foolishly!) sold several of them when I sold my business a couple of years ago. I don't use them nearly as often as I should, but I do display one or two in our library. Yours are gorgeous and obviously well-loved and cared for. I really like the one with the colored liner. I have several with clear liners to allow for food service, but I've never seen a beautiful colored liner like that. Delicious! The flowers on your table are gorgeous, and everything is absolutely stunning. I am floored by the sheer gracefullness of it all. I hope you have a peaceful weekend. My husband and I are scheduled to fly to Savannah, GA next week. I should be good to go by then...at least I hope so! I will wave to you as we fly over Tennessee! Take care, and thank you again for being the quintessential gentleman's gentleman! I typed a lengthy comment and somehow lost it. I will make this one short. Table AWESOME!!! Love your Revere bowl collection especially the lined one! They give the flowers a run for center stage. Great pairing of elegance. I have coveted your votives since I saw them in a previous post. Found a poor substitute, but only a substitute. I still covet yours. Beginning of spring and baseball season and you knock another one out of the park. Oh, We are nearing the anniversary of The Midnight Ride (April 18, 1775) of Paul Revere. Great patriot!! Thanks for the salute to him and his work. I am thinking I need to look behind the closed lower doors of my china cabinet and find my Revere bowl and see if my daughter would like some flowers in it for her wedding. Thankfully she has someone in mind to arrange them for her as my skills would be rather lame, but I could dig it out easily. Bill, as ever --- GORGEOUS!!!! Again my eyes roamed over every detail; taking it all in. Thank you for the education in the Revere bowls --- especially nice for me since I have been transplanted to N.E., about an hour from Boston. I, too, like the Revere bowls, but my favorite thing on your beautiful table this week is the flatware. The flowers are really beautiful and I love how you did the napkins! In the words of Charlie Sheen...your table is WINNING!!! Seriously, I found the information on Revere fascinating! Another perfect tablescape. You have such a wonderful flair for setting an elegant table. And you have a lot of exquisite things to work with! I really appreciate the information you put in your posts as well as the very artistic photos to ogle. Thank you Bill for the history leason. I must have been in the bathroom smoking the day we studied the revere bowl. I'm positive that your style makes it all the more special. I love visiting here so much. I'm in the process of developing a relationship with my new Canon Rebel and should be posting soon again. The end of last year found me without computer or camera, Nuts!! All is being remidied now.